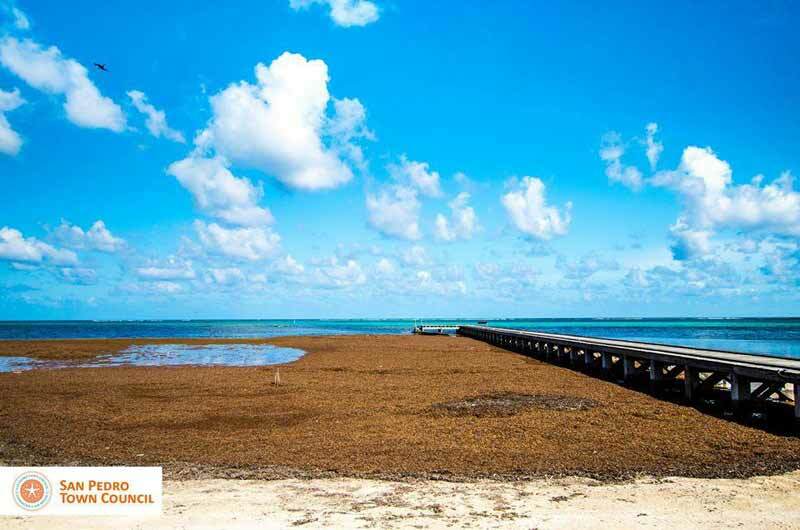 The San Pedro Town Council recognizes the massive natural disaster caused by the significant amount of sargassum that has been washing up on our beaches. While we have experienced this phenomenon in the past, this has been the worst we have seen over recent years. Over the past months, the council has used all its resources available to ensure that our beaches are clean to an acceptable level. Nonetheless, this is now something that requires more than just efforts of the local government and as such the council is declaring this issue a natural disaster. We urge our residents, as well as the business sector, the tourism sector, non-governmental organizations, government agencies and our national government to join our collective efforts in addressing this issue, both in the short and long terms. 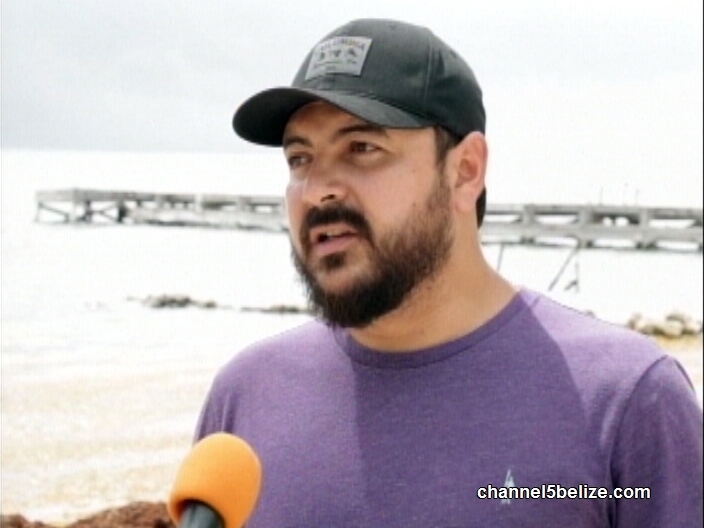 In the short term plan, the San Pedro Town Council has secured the assistance of well-respected Belizean Marine Biologist and Consultant, Mr. Miguel Alamilla. 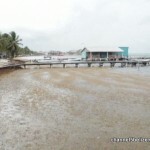 He will guide our efforts in finding ways to mitigate against tons of sargassum that is beaching on Ambergris Caye. The SPTC has mapped out both a short and long term plan. Continuing the short term plan, the SPTC is organizing a massive community clean-up campaign of our beach from Boca del Rio to the Mosquito Coast area. This event will take place on the 27th & 28 of September. We are encouraging all residents, businesses and organizations that have trucks, bobcat loaders, excavators and even manpower, to register their participation by Wednesday, September 26th at the offices of the SPTC. It is our plan that all the sargassum will be removed from the beach, to be taken to a specified location where there is less human contact. The meeting point for the community clean-up campaign will be at the San Pedro Central Park at 6AM on both days. 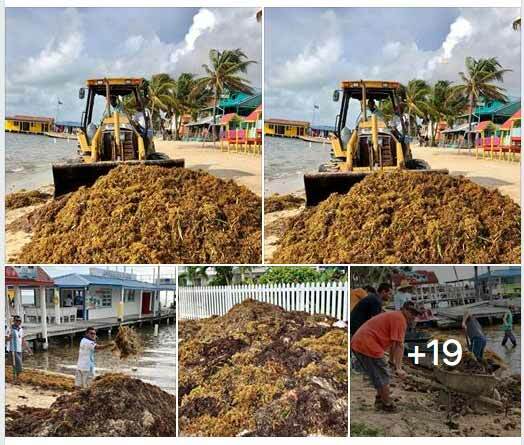 On an initiative being led by Councilor Gary Greif; who has the portfolio responsible of the environment, the San Pedro Town Council and other stakeholders are also looking at several options as a long term plan that will minimize the sargassum from beaching on the island. These options include the possible acquisition of water deflection booms that would be placed at a 2/3 distance between the island and the reef. Both local and international technicians have visited San Pedro to conduct bathymetric and current flow studies. It is their belief that the placement of these water deflecting booms will prevent the sargassum from making landfall and instead current will take it pass the southern end of Ambergris Caye. Councilor Greif has been dialoguing with resort owners whom are in the process of purchasing similar type of booms, which in the future will be able to be part of the larger project. It will take a collective effort to ensure that we keep our island clean, for both our locals and tourists to enjoy. 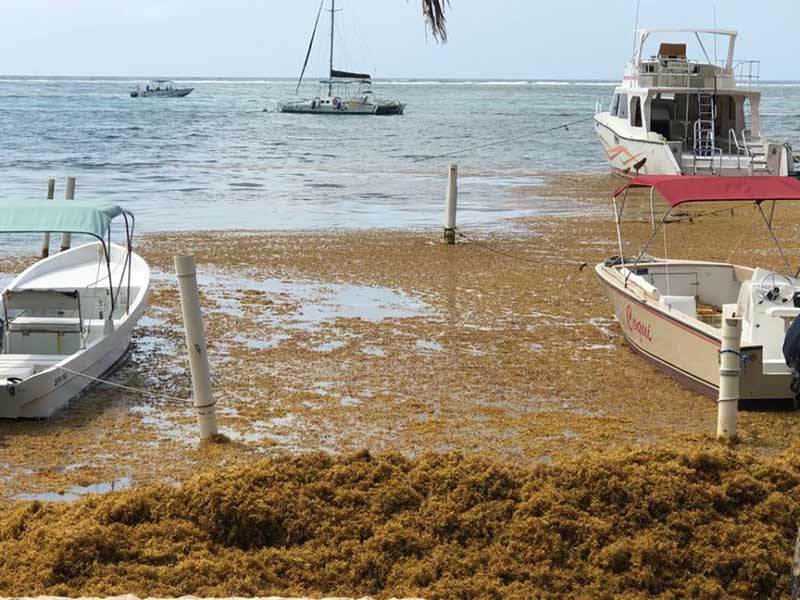 The San Pedro Town Council has declared the sargassum beaching a natural disaster and is calling on its residents to come out on Thursday and Friday for a massive cleanup. 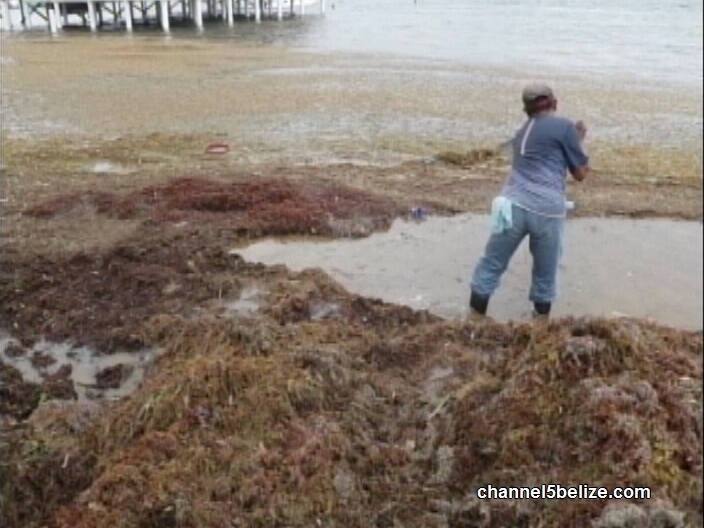 News Five has been following the sargassum attack on Belize’s beaches for weeks. Tons of the microalgae have washed up on beaches across the country, affecting not only residents but entire industries such as the tourism. While the sargassum phenomenon has been experienced in the past, but this year, it reached crisis proportions, eroding miles of white sandy beaches everywhere. 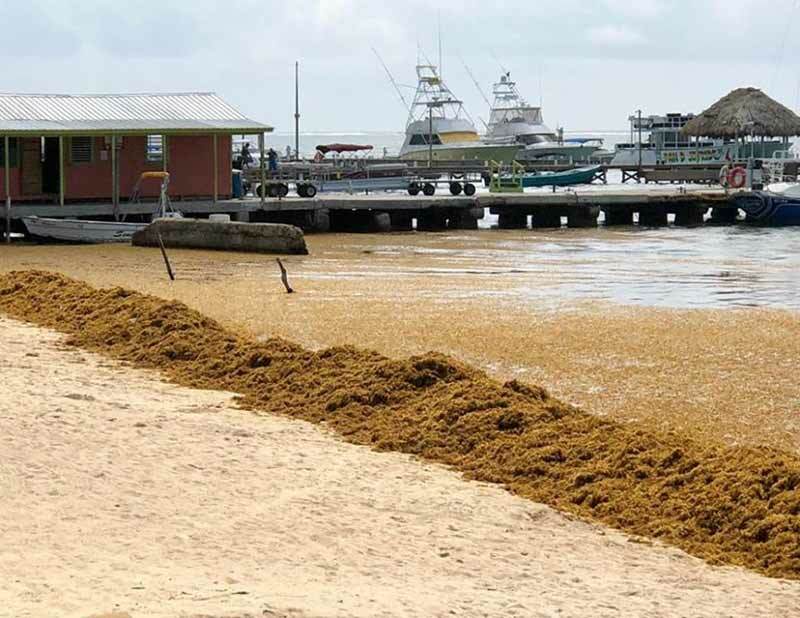 A National Sargassum Task Force was established in 2015 at the onset of the problem, but years later, there has not been a solution. The San Pedro Town Council says it will take a collective effort to address the environmental disaster. News Five’s Hipolito Novelo reports. 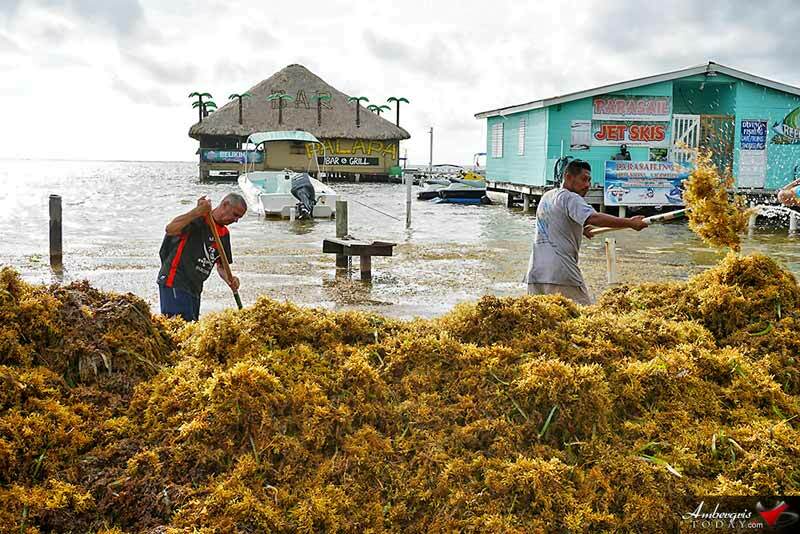 San Pedro Town is in crisis mode with its council declaring the sargassum invasion a natural disaster which has washed up on the beach. 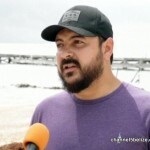 Gary Grief, Councilor for Environment and Tourism, S.P.T.C. 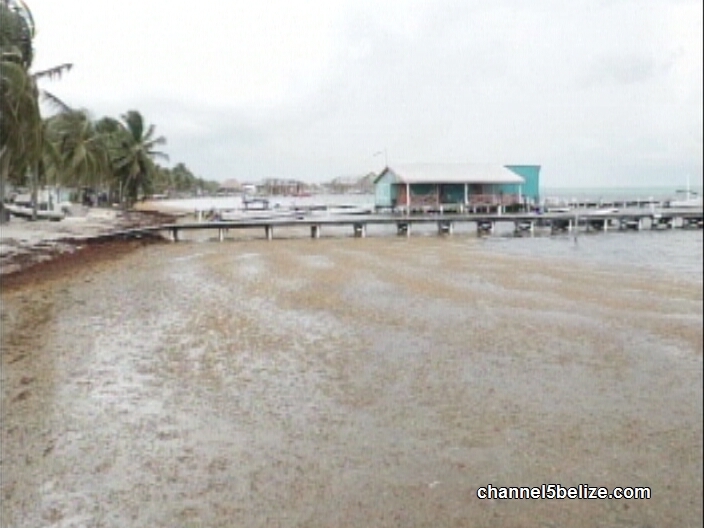 For the past months, sargassum- a brown microalgae- has been slowing creeping up on the beaches of la Isla Bonita turning one of Belize’s top tourist destinations into a vacation nightmare. Several businesses like Ramon’s Village Resort have taken it upon themselves to fight off the sargassum. They have constructed and installed barricades made of nets and pipes to prevent the sargassum reaching the shore. 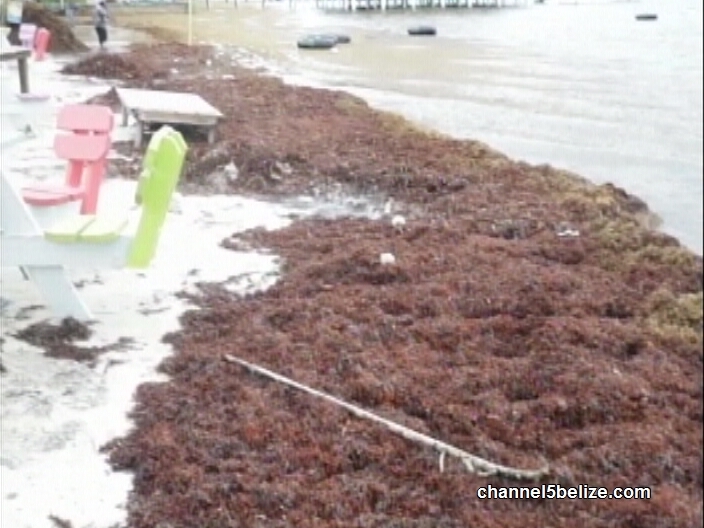 Alive, the sargassum doesn’t pose much of a threat but once it reaches the shore it begins to decompose releasing not only a foul odor in the atmosphere but hydrogen sulfide which can cause health complications for town residents and tourists. The San Pedro Town Council, for the past months, has been deploying cleaners along the beach, to remove the dead sargassum but it is simply too much for the council to handle on its own. San Pedro’s Town Councillor responsible for Environment and Tourism, Gary Grief, says that central government needs to step it as thousands of livelihoods and the fate of San Pedro’s tourism industry is at stake. But before that happens, the town council is calling on all residents, and volunteers to be part of a massive cleanup campaign on Thursday and Friday from Boca del Rio to the Mosquito Coast area. It is expected that the purchasing and installation of the water deflection booms will come at a hefty cost. 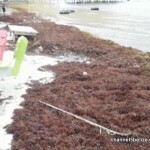 Studies show that the sargassum problem will worsen in 2019. 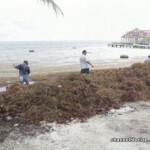 Sargassum cleaning campaign in San Pedro Town today! Volunteers are welcome! San Pedro residents, local authorities and private sector respond to emergency call for help by the San Pedro Town Council. Local authorities invited the entire island community to join their collective efforts in addressing the issue in the short and long term. The first step took place early in the morning on Thursday, September 27th and Friday, September 28th with a massive community clean up from the Boca del Rio Area to the Mosquito Coast area south of San Pedro Town, in an attempt to remove as much of the invasive seaweed from the beaches as possible. Hundreds of islanders answered the call to action and at 6AM, they convened at the Central Park from where they headed towards the beach in different groups. They tackled different areas along the stretch of beach in an effort to cover as much surface area as possible. 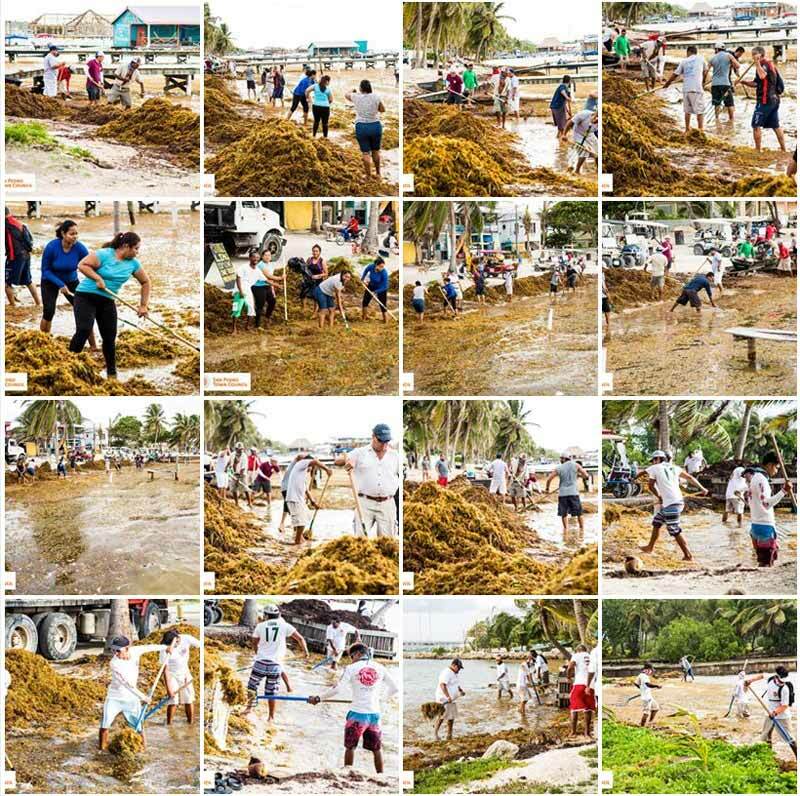 Island residents were joined by Mayor Daniel Guerrero along with Councillors and staff of the SPTC, as well as the representative from the Opposition the People’s United Party Andre Perez, in the joint initiative that saw tons of the seaweed being removed from the island’s shores. Hotels like Ramons’ Village volunteered numbers staff members to join other residents who heeded to the Town Council’s call for the community cleanup. San Pedro Mayor, Daniel Guerrero said that he was impressed with the turnout this morning. 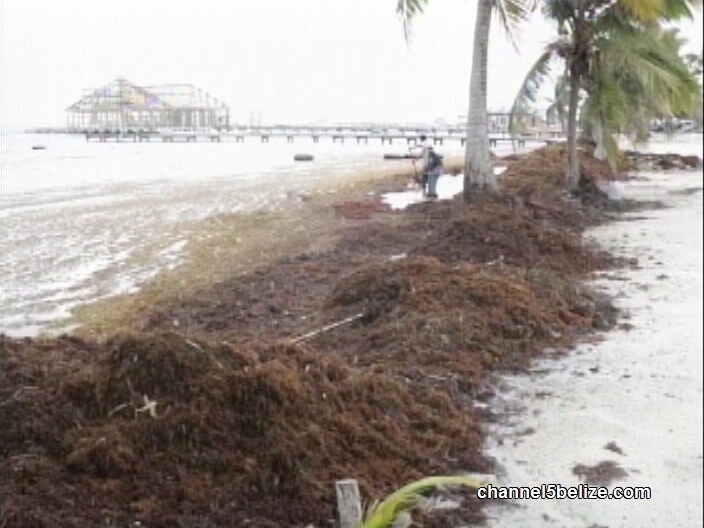 With the looks of the amount of sargassum on the beach, it will take more man power and a larger community effort to make an impact on the cleanup efforts. It’s a daunting task, but one that needs to be tackled head strong. 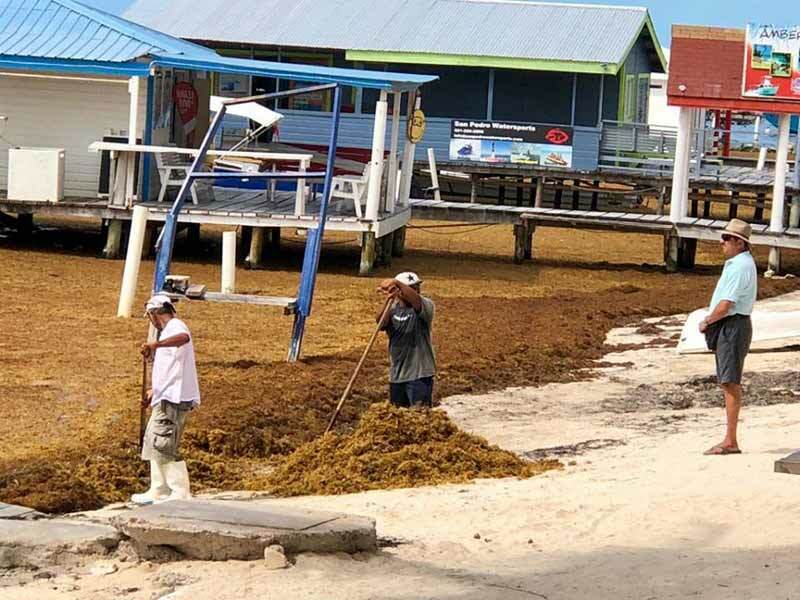 Already the smell of the decomposing sargassum is affecting the tourism industry and the lack of beautiful beaches and crystal blue sea by the shore is driving visitors away. Residents are suffering from breathing complications, itchy skin, problematic breathing and sensitive eyes. The sargassum’s hydrogen sulfide byproduct as it rots is also affecting electronics, mostly televisions that have gone bad in the past months plus is corroding silver and other metals. The 2-Day Sargassum Community Clean Up initiated at 6:00 in the morning on September 27, 2018. 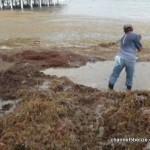 Here are pictures of the volunteers that helped in removing the sargassum from the shores in the morning. THANK YOU TO EVERYONE WHO CAME OUT TODAY AND TO THE RESTAURANTS THAT PROVIDED LUNCH FOR OUR VOLUNTEERS! What a great turnout for the first day of the clean up! A total of approximately 70 truck/vehicle loads were recorded. It represents approximately 649 yards of sargassum; 146 people donated their time, averaging to approximately 1090.5 hours. Note that he figures may increase since group 5 (Escalante Area) only provided data up until midday; however, they were still out until after 4:00 p.m. Group 2’s data(Palapa Bar area) was up until 3:00 p.m. and trips were still leaving at 4:30 p.m.
Join the progress, less talking & more action!!! If you can’t make it, encouragement will help!! A second clean up is planned for Friday & Saturday... let’s see if we get a bigger turnout! As part of the ongoing short and long term plan for the island, the San Pedro Sargassum Task Force Group (SPSTFG) was formed. 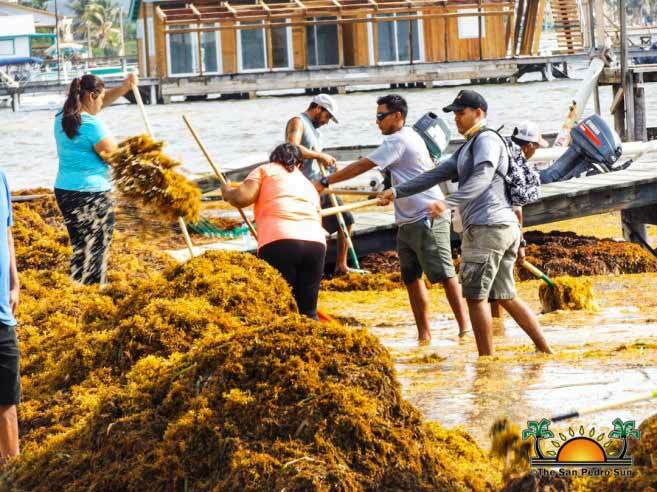 The San Pedro Sargassum Task Force Group will assist the San Pedro Town Council carrying out its short and long term mandate as it relates to addressing the non-stop large influx of sargassum that is beaching on the island. The group includes representatives from the San Pedro Town Council, San Pedro Tour Guide Association, San Pedro Chapter of the Belize Tourism Industry Association, representatives from the San Pedro Poly-Clinic, San Pedro NEMO Coordinator and a few volunteers. 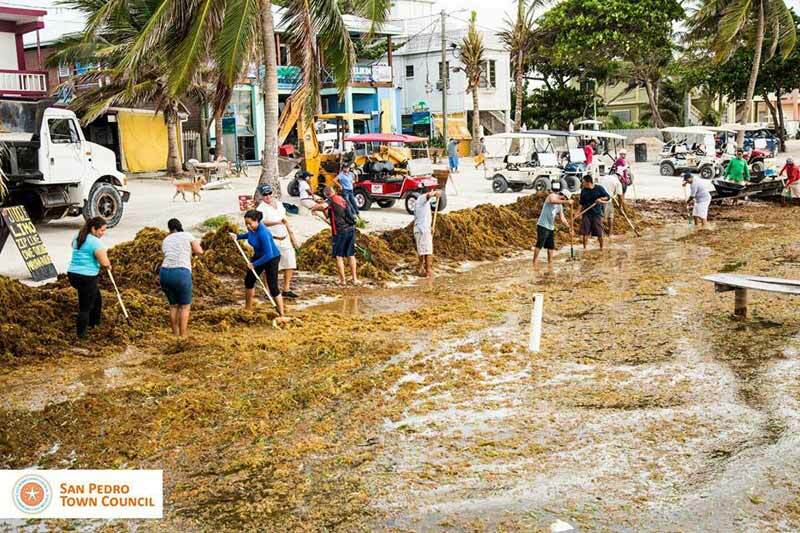 With the support of the task force group, on the 27th and 28th of September, the community of San Pedro united to participate in a community sargassum clean-up campaign in the downtown area of San Pedro Town. The SPTC and the task force group are happy to report that over the course of the two days, two hundred thirty two (232) individuals volunteered a total of two thousand eighty six (2086) hours of free labour. This resulted in the removal of approximately onehudred forty four (144) truckloads or one thousand seven hundred (1700) yards of sargassum. A volunteer fleet of eight (8) trucks, three (3) pickups and five (5) backhoes were used to assist in the clean-up efforts. The total cost to the clean-up two-day event is equivalent to twenty two thousand eight hundred dollars ($22,800.00).